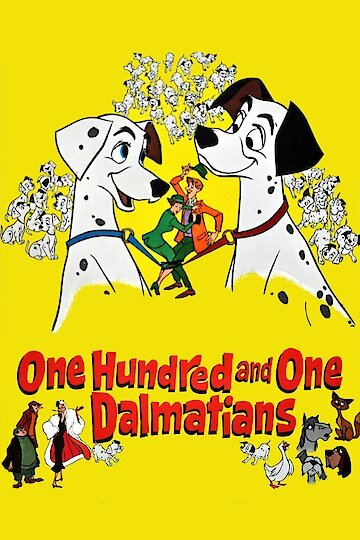 "The Canine Caper of the Century"
Join Pongo, who is one of the first Dalmatians in the film, as he falls in love with another dog. Roger is a man who lives in London. He is also the owner of Pongo. Pongo decides that Roger might need a wife, so he causes Roger and a lovely woman to meet in the park. This also works well for Pongo because the woman who Roger meets has a female dog named Perdita. Roger and Anita get married along with Pongo and Perdita. The dogs are soon greeted by a litter of 15 puppies. Cruella De Vil tries to take the puppies away. Other dogs in the city try to help get the dogs back, but there is some surprising news and Roger and Anita discover just how many dogs De Vil has taken from homes.